Current medical practice is moving towards more quantitative and personalized methods of diagnosis and decision-making. This has led to a need for more complex and detailed patient-specific digital models. The resolution at which the model is described is important and may vary from macroscopic to microscopic and even molecular scales, ideally through multiscale descriptions. As these individualized models start to integrate knowledge of cellular dynamics, it becomes crucial to acquire patient-specific information at the cellular level. The goal of the cooperation between the Asclepios research group at INRIA Sophia Antipolis and the company Mauna Kea Technologies (MKT), Paris, is to develop advanced image analysis tools capable of extracting the pertinent information from in vivo confocal microscopy images. This is a first step towards the integration of individualized cellular dynamics information in the physiological models we develop at Asclepios. Mauna Kea Technologies - Cellvizio® family of endo-microscopes rely on a unique approach for the in vivo and in situ exploration of living organisms. Simply stated, this involves putting a microscope objective at the end of an ultra-thin, three meter long optic fiber. The Cellvizio® acquires image sequences of microscopic resolution, displays them in real time and enables live measurements. The confocal miniprobe, one of the Cellvizio®'s three components, is a custom-built highly advanced optical imaging probe incorporating a proprietary fiber bundle and objective lens technology. Coupled to the laser scanning unit, the sophisticated image processing software renders real-time dynamic image sequences with a lateral resolution as fine as 2.5µm and a field of view of up to 600µm at 12 frames per second. Figure 1: Fibered confocal microscopy allows the clinician to perform micron-scale resolution optical biopsies and to diagnose the state of a tissue in vivo and in real time. Left: Normal gastric pits. Courtesy: PD. Dr. A. Meining, Klinikum rechts der Isar, Munich. Right: Alveolar Network. Courtesy: Pr. L. Thiberville, CHU Charles Nicolle, Rouen. Figure 2: Mosaic reconstructions can increase the field of view while enhancing the image definition. Top: Healthy colonic mucosa (26 images). Bottom: Microscopic colitis (98 images). This specific imaging modality raises certain image processing problems. For example the raw data generated by the instrument shows geometric distortions and a non-uniform honeycomb pattern due to the modulation of the fiber optic bundle. This makes the data impracticable for automated analysis if left untreated. Algorithms that take on the image reconstruction task in real time have thus been developed in order to provide high-quality, smooth-motion video sequences. 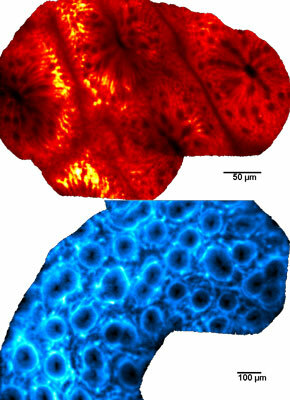 Fibered confocal microscopy can unveil in real time the cellular structure of the observed tissue. However, as interesting as dynamic sequences may be during the time of the medical procedure or biological experiment, it is necessary to have an efficient representation of the entire imaged region. Mosaicing techniques can be used to provide this representation. However classical algorithms do not take into account the characteristics of fibered confocal microscopy, namely motion distortions, irregularly sampled frames and non-rigid deformations of the imaged tissue. This is why specific novel algorithms were developed. With these mosaics, quantitative and statistical analysis becomes possible over a wide field of view. The quality of the data that can be used to build cellular-level patient-specific models is thus improved. Moreover, mosaicing for microscopic images is a means of bridging the gap between microscopic and macroscopic scales. The combination of Cellvizio® and image processing therefore provides a unique way to build patient-specific digital models at the microscopic scale.